Eslohe-based cranes service provider Blüggel Krane has taken delivery of the first 160 tonne Terex Explorer 5600 All Terrain crane in Germany. 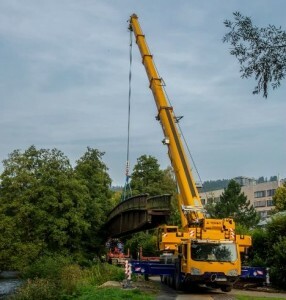 Its first job was to lift a 17 tonne bridge, measuring 29 metres in length, on to a heavy haulage vehicle at a radius of approximately 20 metres. Once the bridge was taken to the new location, the crane then lifted it and set it down on top of its concrete piles. The five-axle 5600 features a seven section 68 metre main boom with a bi-fold swingaway and a 12 metre straight insert, offering a maximum tip height of 95 metres. Features include a single engine concept, start/stop function, wireless remote control, and Terex’s IC-1 control system.